Here is a photo that I shot yesterday on my hike through the Schellbruch Area. 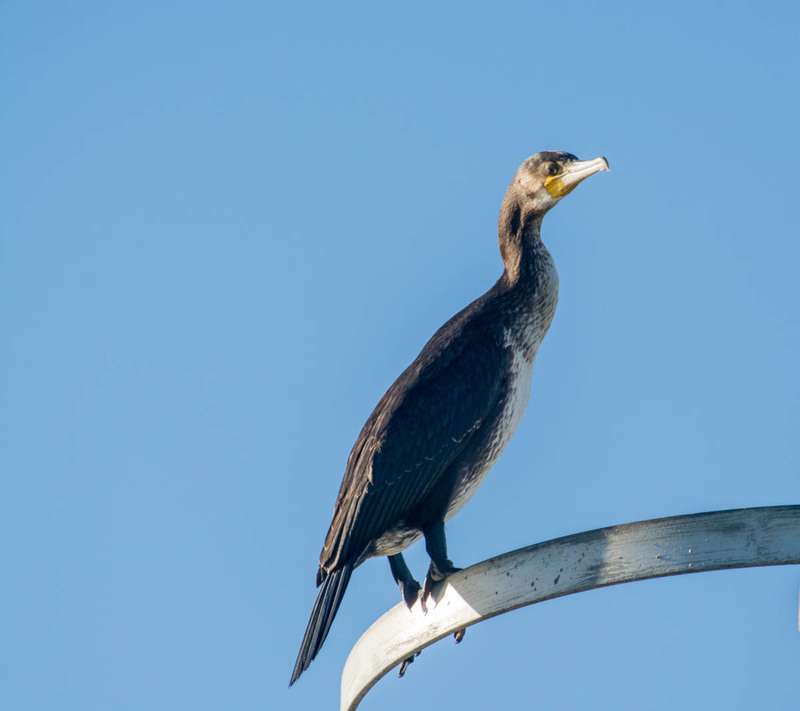 It’s a great black cormorant (Phalacrocorax carbo) also known as great cormorant, black cormorant, large cormorant and black shag. It’s quite easy to find them here in and around Lübeck close to the Baltic Sea. I found them in and around several towns and villages in our federal state Schleswig-Holstein. If there is water, there is a good chance you will find cormorants. They like to be close to the sea, or you find them at rivers or even at the ponds in the city. They pause at one position for a long time, either alone. I like them, like all other birds. We have those here too. I like them because they are the only bird that I know of in Florida that can swim underwater. That’s true, they do dive and it’s funny when they do that, because afterwards they sit there for hours at one place and spread their wings for a long time to dry them in the sun 😀 I always wondered why they sit there with spread wings for so long but I am glad we can find those answers today thanks to the internet. They can’t fly well after the diving, which is why they have to dry their wings after a dive 😀 I have some photos of cormorants that dry their wings, I should edit them and upload them to the blog. They have taken over a lot of areas that used to be the hunting ground of other birds. Very efficient fishers. So true. When I am somewhere near the water outside of the city, it doesn’t take a long time to find them. Of course you see gulls and ducks first, but recently it’s almost as easy to find cormorants.